Most know Gord as a musician and member of The Tragically Hip, the Kingston band that created the quintessential Canadian soundtrack. However, Gord has also been a tireless champion and dedicated steward of Lake Ontario as a supporter and Board member of Lake Ontario Waterkeeper. Gord always considered himself a citizen of Lake Ontario. It was his experiences in the waters surrounding Kingston that have fueled his powerful sense of belonging and inspired him creatively for decades. Gord grew up in the small town of Amherstview until, in the 1980’s, Gord’s family moved into a house directly across the street from Lake Ontario. Directly across the street from Breakwater Park. The city’s decision to invest in Breakwater Park is an important milestone. Many municipalities and cities have fenced off public access to their waterfronts. Overtime this creates a disconnection between residents and their lake. They feel like it is not their lake to enjoy and in turn not their lake to protect. 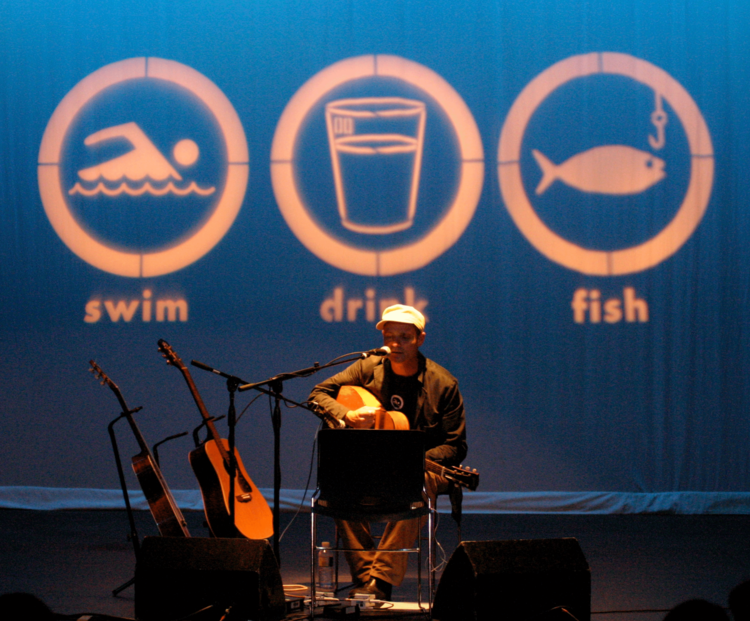 Through the years Gord worked with Waterkeeper to connect people to water. One of the most influential moments was producing The Heart of A Lake tour. An amazing show of words, poetry, dance, and song that shared our love of water and the lake with others. But Gord also worked hard on the issues. He surrounded himself with books, lengthy government reports, and attended public hearings. He studied the science of ecosystems, of watersheds, and run off. Gord understood every aspect of protecting Lake Ontario and never let his celebrity give him a pass on the hard work. His passion for protecting Lake Ontario was all consuming and that, not his celebrity, is what has made him an effective leader, a champion for Lake Ontario. Most recently, more great things have happened. The W. Garfield Weston Foundation was looking to invest $1 million into protecting the Great Lakes and connecting communities to water. We were honoured to be chosen to help identify critical projects that would help make that happen, setting an example for others. After reviewing hundreds of projects we were drawn to a park in downtown Kingston where the City wanted to restore community water access. It was the perfect idea. The City received a $500,000 commitment from Swim Drink Fish Canada through The W. Garfield Weston Foundation towards the Breakwater Park redevelopment. The project represents for us the perfect combination of a partnership between an NGO, private funding and government leadership around a strong vision - connecting people to water. Through these partnerships with our organization, The W. Garfield Weston Foundation and the other levels of government through the Canada 150 Community Infrastructure Program, the City of Kingston is projected to complete the project and restore water access one full year earlier than they expected. After our agreement with the city was finalized - it was suggested that the park be named in honour of Gord Downie for his vision as well as his connection to this place. Why? Gord once said “The Lake Ontario of my mind; it’s always there, when I express myself, that is where I go.” Just hearing these words sends chills up and down my spine. I feel the exact same way. The improvements to Breakwater Park—swimming access, real-time water monitoring, and the restoration of fish habitat—are truly the realization of Gord’s vision for Lake Ontario. Which is why—though Gord is typically reluctant to accept such honours—has humbly agreed to accept the dedication of the Swimming Pier. The Gord Edgar Downie Pier is the first of its kind in Canada. No other city has been bold enough, committed enough to offering a swimmable, drinkable, fishable urban waterfront as Kingston has. Kingston stands alone, again, head and shoulders above other cities in this regard. The Gord Edgar Downie Pier was formerly known as the PUC Dock because that’s exactly what it was. By investing in improvements like shade umbrellas, benches and pool ladders the city will breathe life into this old structure and create a destination for residents to experience their lake. For now this park is one of a kind. Our hope is that it doesn’t stay that way. When it comes to water, our hopes and dreams not our fears should lead us. Shared values between friends and allies can get things done. Even restore swimmable drinkable fishable water to our communities. Clean water is good for the recreational users and for the commercial fisherman, the captains and the farmers, the children and the adults, the economy and the community. It is good for everyone. That is what Kingston's Gord Edgar Downie Pier is all about. The park, the partners, and the name, in my opinion, are just perfect.